AB Emblem's sold out COLBERT space patch and the astronaut treadmill it celebrates. Nearly a month before the payload it celebrates is scheduledto launch to space, a collectible embroidered patch has sold out, with no plansfor it to be produced again. From the moment it was revealed last April,the insignia celebrating NASA's next space station-bound astronaut exercisedevice was in demand, which might have been considered unusual if it wasn't forthe fact that the design featured both the name and cartoonlikeness of comedian Stephen Colbert, star of Comedy Central's"The Colbert Report" parody talk show. The official NASA insignia came as part of a consolationprize of sorts, after Colbert staged a write-in campaign to win a NASA poll asto what to name the International Space Station (ISS)'s next connecting module.Despite getting the most votes, "Colbert" was set aside for"Tranquility," a name NASA deemed was more appropriate. To recognize Colbert's effort to draw new attention to theiractivities however, NASAannounced it was naming the ISS's new astronaut exercise equipment afterhim: the Combined Operational Load Bearing External Resistance Treadmill(COLBERT). Its emblem, which will be affixed to the device in space, depictsthe comedian runningon the treadmill. Fans of both the TV and space programs expressed theirdesire to own the insignia, sharing their longing on social networking websitesand on the Colbert Nation forum, an online meeting place for the show'sloyal viewers. And it didn't take very long for their wishes to be granted:just a month later, the patch hit store shelves at NASA visitor centers andthrough space collectible retailers. 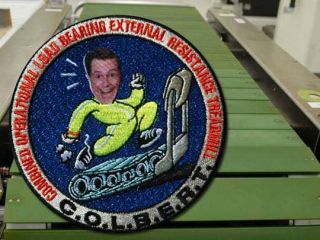 AB Emblem began production of the COLBERT patch after seeingthe insignia on NASA's website. The art is credited on the site as originatingfrom the agency, which was accurate. NASA hired Media Fusion of Washington, DC,to develop the design, under a contract they had to perform graphic design andcommunications work. Under most situations, the credit to NASA would indicate theimage was in the public domain and free to use. Most NASA insignia however, do not include depictions ofidentifiable people. Under its posted policies, the space agency cautions thatif its image or photo to be used is for commercial purposes and includessomeone who can be recognized, then permission should be sought from thatperson. "It does feature his face and so there are usabilityrights," explained Jacob Keaton, space station program analyst and NASA'smanager for the Name the Node Contest. "[Colbert] has to sign off on itsuse." NASA had tried to arrange for expanded use of the design buttalks with Comedy Central stalled. "They were okay with us using it on the treadmill,actually physically putting it on the treadmill that was going up to the spacestation, but we never came to a full agreement on exactly what else we could dowith it," said Keaton. AB Emblem wasn't aware of that, but once they were and hadheard from Comedy Central, they ceased the patch's production. "They said [the insignia] was never intended to be usedfor retail," said James Melley, national sales manager for AB Emblem. By then however, the company had sold and shipped a smallfirst run of the patches to customers including the Kennedy Space CenterVisitor Complex in Florida, Space Center Houston in Texas as well as to onlinespecialty retailers including The Space Store and Spaceflight Now. "It was definitely one of our quickest sellers,"said Justin Ray, editor of SpaceflightNow.com. Ray's store, as well as the Kennedy gift shop and The SpaceStore all report being sold out and have removed the patch from their websites.Space Center Houston said on Monday they had only two of the patches left. A search on eBay.com on Monday turned up only two listingsfor the patch, one with eight available, the other with "more than10". Each was priced at less than $5 each, which was in line with what thenow sold-out retailers had charged. When reached for comment, a spokesperson for Comedy Centralwas not immediately aware of any plans to offer the patch or other logo itemsfor sale in the future.